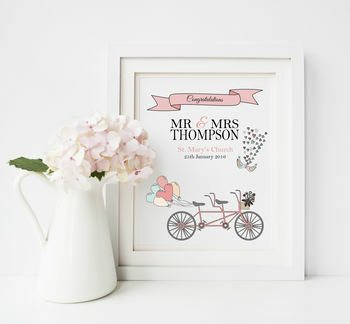 This is a beautiful, personalised keepsake print featuring a tandem bike for the happy couple! This lovely personalised print is a great way to celebrate a new marriage and will be sure to surprise and delight the newly weds. Designed using superb illustrations of a tandem bike and love birds, this will make a great wedding gift for a special couple. This print can be personalised with the wedding venue and date to make it extra personal. High quality enhanced white paper with a matte finish. Our prints are sold mounted, unframed. We do however, offer a framing service at an additional cost, which can be selected in the 'framing options' drop down menu. This product is dispatched to you by Lisa Marie Designs.